The first business continuity textbook specifically designed for undergraduate and graduate courses in business continuity and risk management. Also suitable for corporate training programs or self study. Flexible, modular design that allows for inclusion of topics based on your course objectives. Comprehensive Instructor Materials, including syllabi, test bank, PowerPoint slides, and sample solutions to case studies, discussions, and end-of-chapter questions, available to instructors when book is adopted as classroom text. Buy eBook from Amazon or Google Books! Comprehensive, extensively classroom-tested business continuity textbook and risk management textbook plus extensive, proven instructor materials. Holistic coverage of both business continuity and risk management and how these two growing fields interface. Chapter objectives, discussion topics, review questions, case studies, bibliography; numerous charts and graphs. Ten chapters to serve as a core course. Three additional chapters with greater detail on information technology and emergency management for use depending on class focus. Four additional chapters on risk modeling can be incorporated into a comprehensive risk management approach to business continuity management (BCM) or serve as a separate course at the upper undergraduate or graduate level. Two of the many case studies are integrated throughout the text to give students experience in applying chapter principles to a service company and a manufacturer. Instructor Materials, including syllabi; test bank; PowerPoint slides; and sample solutions to case studies, discussions, and end-of-chapter questions. All materials available to instructors when book is adopted as a classroom text. Authors include a college professor, who is also editor-in-chief of the International Journal of Business Continuity and Risk Management, and a management consultant with 20+ years of experience in business continuity and emergency management. This book is your core business continuity textbook covering the body of knowledge for this growing field. Although business continuity management (BCM) has matured as a distinct discipline and more colleges are offering courses in the subject, instructors had to choose books written for practitioners to serve as classroom texts. Since books for practitioners books were written with students in mind, most also lack instructor resource materials. The Authors of this groundbreaking textbook have sought to provide the first academically-structured, student-friendly approach to preparing for a career in the interconnected fields of business continuity and risk management. 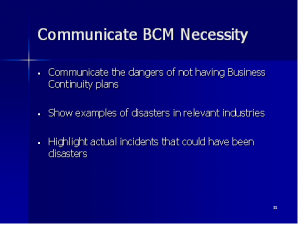 If you’ve been thinking about starting a new course in Business Continuity Management (BCM), this comprehensive package will expedite your course design and implementation. If you’ve been searching for student-oriented materials for the classes you already teach, then you’ll find that the chapter discussion topics, review questions, and case studies will give your students an accessible, readable blend of academic principles and practical applications. This book can serve as a primary text in an undergraduate or graduate level course that focuses on business continuity and risk management or as a supplemental text in a closely related field. Business students majoring in any concentration, including operations, information technology, management science, finance, accounting, marketing, human resources, management and international business, will also find this book both interesting and useful. Emergency management and management engineering students will also find this book a valuable resource. Comprehensive licensed instructional materials are available on confirmed course adoption. Contact Rothstein Associates Inc. to request a complimentary copy to evaluate for classroom use. Below is the brief full text of the FOREWORD. Please note that it is followed by links to PDFs of selected chapters, preface and glossary. As a business continuity professional serving New York’s Wall Street firms, I have been an active part of how the profession has evolved. Not that long ago, business continuity was viewed as an afterthought by many organizations — a form to complete and a box to check off. The defining moment, however, for me and for many senior managers now leading business resiliency and risk programs in major corporations — as well as our firms’ senior leaders — was the crucible of the World Trade Center disaster on September 11th. This unimagined tragedy of unimaginable proportions taught us that no threat is impossible. Planning and preparation for both the possible and impossible, we learned, are essential for any organization. 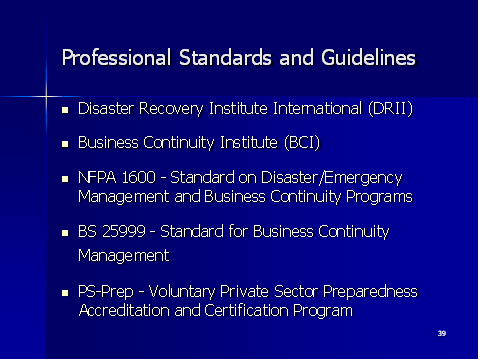 Many of us learned business continuity and risk management by doing it, strengthened along the way by a growing international body of experience and knowledge drawn from practitioners and academicians. Kurt Engemann and Douglas Henderson have made a fundamental contribution with their focus on resiliency issues. In an “open source” format, they have assembled a core curriculum spanning a discipline that traditionally took major portions of a career to experience and understand. A blend of theory, common sense, best practice and cases, this versatile textbook provides a structured learning tool and encyclopedic reference guide for business continuity and risk management students, teachers, practitioners, and executives. One of my favorite chapters focuses on awareness and exercises. In March 2001, at the Wall Street firm where I headed Business Continuity at the time, we completed a major disaster recovery exercise for a scenario covering the complete loss of our primary data center near the World Trade Center. This scenario and much worse was realized six months later. On that day our preparation and exercises rewarded us with the restoration of key information processing capabilities at a backup location in just over two hours. Through resilient operations and people, these efforts played a key role in helping restore basic functionality to the markets and the financial services industry affected by 9/11. No one can foresee the future. But I believe that this can be no excuse for lack of preparation, management support or exercises that improve awareness and continuously sharpen our organizational and technical response to adversity. We repeatedly experience the unimaginable — whether Mumbai terror attacks, tornado clusters, earthquakes or tsunamis. Crises will continue to arise, as will our need to understand and practice the essentials of organizational resilience. NOTE: The writer is not necessarily representing the views or opinions of JPMorgan Chase & Co.
Below are links to PDFs to selected chapters, preface and glossary. Please note that only 5 pages of each are displayed to provide a sense of the content and style. Each is copyrighted and permission is granted to use this material for textbook adoption evaluation only. Kurt J. Engemann is the Director of the Center for Business Continuity and Risk Management and Professor of Information Systems in the Hagan School of Business at Iona College. He has consulted professionally over the past thirty years in the area of risk management decision modeling for major organizations and has been instrumental in the development and implementation of comprehensive business continuity management programs. 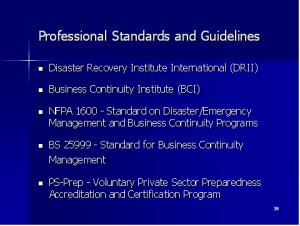 Dr. Engemann is a Certified Business Continuity Professional (CBCP) with the Disaster Recovery Institute International. Professor Engemann is the editor-in-chief of the International Journal of Business Continuity and Risk Management and the International Journal of Technology, Policy and Management. He teaches courses in the areas of Business Continuity and Risk Management, Systems Analysis and Design, Operations Management, Statistics and Decision Analysis. He has a PhD in Operations Research from New York University and has published extensively in the area of risk management and decision modeling. Professionals from a number of Wall Street banking firms and Fortune 500 companies attend his graduate courses in business continuity and risk management. Douglas M. Henderson, President of Disaster Management, Inc., has 20 years of experience in management with major consulting firms. In August of 1992, Mr. Henderson was the key associate of the Emergency Response Team for a consulting firm located in South Miami-Dade County. Inspired by the real life business experience with Hurricane Andrew and concerned about the lack of preparation within the business community, Mr. Henderson founded Disaster Management, Inc. in 1993. Mr. Henderson’s clients include Bombardier Capital Group, CP Ships, Discovery Channel Latin America, Intek Plastics, Kemper-NATLSCO, Professional Golfers’ Association (PGA), University of Miami, United Educators Insurance Company and numerous other organizations of all sizes. The activities he has undertaken on behalf of these organizations includes conducting site inspections and writing Risk Assessment reports, Business Impact Analysis reports, Business Continuity Plans, Emergency Response Plans and the facilitating of tabletop exercises. Mr. Henderson has a degree in mathematics from the Universityof Arizona. His professional credentials include Fellow, Society of Actuaries (FSA) and Certified Business Continuity Professional (CBCP). He is the author of the book Is Your Business Ready for the Next Disaster? and has developed a number of CD-based templates, including the Comprehensive Business Continuity Management Program, the Continuity of Operations Plan for Colleges and Universities, and the Hurricane and Flood Plan. Upon classroom adoption, this textbook is accompanied by a comprehensive package of instructor materials that include the following six classroom aids. This listing is followed by a display of samples from each aid file to give you a sense of their content, level of difficulty, style, etc. The modular design of the textbook allows it to be used in a variety of courses emphasizing particular subject coverage. Five primary courses are suggested and a sample syllabus can be conveniently customized. This course explores the area of Business Continuity and Risk Management in a comprehensive manner to provide for organizational resilience. Particular emphasis is placed on assessing threats which may lead to disastrous events, evaluating control alternatives and implementing strategies. Practical solutions to enable an organization to mitigate risk, manage crisis and recover after a disaster are discussed. The course is designed to expose the student to all aspects of a holistic Business Continuity and Risk Management program and to determine the most appropriate requirements. 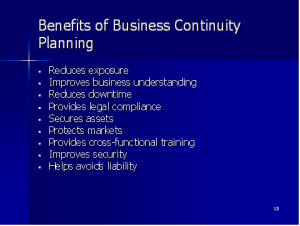 Overview the essential components of business continuity and risk management. Analyze the organizational structure that needs to be in place to effectively prepare for, respond to and recover from a crisis event. Examine threats and prioritize planning by assessing the likelihood of events and their potential impact on critical functions. Examine strategy identification, selection and implementation necessary for an organization to effectively respond to a crisis event. Examine alternate site selection, data center controls, information management procedures and information technology principles to provide continuation and recovery of the systems and communication capabilities of an organization. Review security controls and auditing considerations and apply these concepts to various information technology applications. Define the immediate actions taken during a crisis event with the prioritized objectives of life-safety, environmental protection and asset protection. Examine how an organization should interface with external agencies during disaster mitigation, preparation, response and recovery phases. Discuss the central plan documentation that defines continuity and recovery procedures for crisis events. Investigate the importance of emergency communication, media communication plus the devices and systems used to conduct crisis communication. Review the role that information systems play in the process of managing emergency information before, during and after an event. Discuss the importance of awareness and training, testing and exercising, and maintaining and updating to ensure that plans remain operable and current. Develop a foundation in probability and statistics that is very useful in business continuity and risk management. Explore forecasting techniques, regression analysis and reliability modeling. 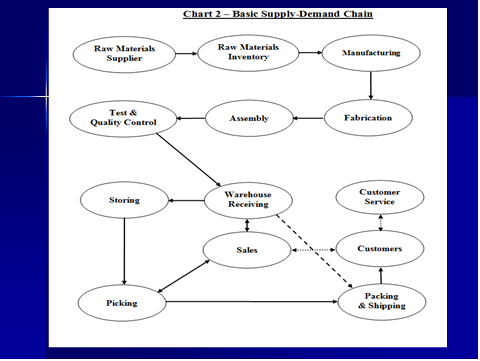 Examine simulation modeling in business continuity and risk management with application to supply chain analysis. Examine decision making techniques under risk and uncertainty. Students must complete all required readings as assigned. Students are to be prepared to discuss the readings, review topics, case studies, previous lecture topics, and assignments during each meeting. Anderson, D., Sweeney, D., and Williams, T., Statistics for Business and Economics, South- Western Cengage Learning, 2011. Aven, T., “A New Scientific Framework for Quantitative Risk Assessments,” International Journal of Business Continuity and Risk Management, Vol. 1, No. 1, pp. 67-77, 2009. Aven, T., Risk Analysis-Assessing Uncertainties Beyond Expected Values and Probabilities, John Wiley and Sons, 2008. Borodzicz, E., Risk, Crisis and Security Management, John Wiley and Sons, 2005. 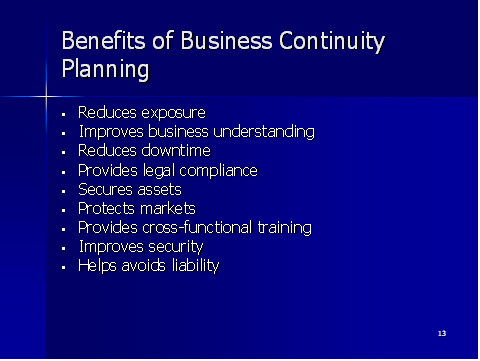 Burtles, J., Principles and Practices of Business Continuity: Tools and Techniques, Rothstein Associates, 2007. Coyle, D. and Meier, P., “New Technologies in Emergencies and Conflicts: The Role of Information and Social Networks,”Washington,D.C.andLondon,UK: UN Foundation- Vodafone Foundation Partnership, 2009. Dhillon, G., Principles of Information Systems Security, John Wiley, 2007. Easttom, C., Computer Security Fundamentals, Pearson Prentice-Hall, 2006. Engemann, K. J., and Miller, H. E., “Critical Infrastructure and Smart Technology Risk Modeling using Computational Intelligence,” International Journal of Business Continuity and Risk Management, Vol. 1, No. 1, pp. 91-111, 2009. A-3.1 For AIS, what are the most critical operations for each operational group and support department? With 40% of the total revenue and 50% of the total profits, Custom Research is the most critical operational group. With 30% of the total revenue and 25% of the total profits, Equity Selection Services is the second most critical operational group. Customer service and ongoing contact with customers by all Operational Groups is considered to be critical to the business. Although the various operational groups of AIS can function independently, all operational groups are dependent on Data Operations (data acquisition, data verification and data analysis) providing accurate data. Information Technology (system applications and communications) services are also critical to all aspects of AIS business operations. Facilities (environmental controls and utility services), Finance and Accounting (crisis communication), and Security (facility protection and threat monitoring) are all critical operations. A safety and/or security failure will create a dangerous environment and shutdown business operations immediately. Also note the following very important business activities include Finance and Accounting (public communications, insurance services) and Human Resources (payroll* and certain benefit services). * Human Resources (Payroll) is ranked as ‘very important’ and not as ‘critical.’ Although some professionals rank Human Resources (Payroll) as ‘critical,’ actual payroll services are typically outsourced and, in any event, processed a few days in advance of the actual pay date — this extra time ensures that employees will not experience an immediate cessation of paychecks. A-3.2 Identify the major interdependencies within AIS business operations. Although the various operational groups of AIS can function independently, all operational groups are dependent on Data Operations (data acquisition, data verification and data analysis) providing accurate data. All aspects of AIS business operations are dependent upon Information Technology (system applications and communications) services. A-3.3 What are the Recovery Time Objectives for the following operations? A-3.4 Is it logical to set initial Recovery Time Objectives for support operations equal to something less than 100% for certain responsibilities? Yes. Support operations often render services to both critical and non-critical business operations. It is quite possible that adequate support can be rendered to critical business operations with less than 100% recovery capabilities. 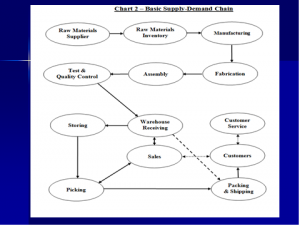 A-3.5 Identify the major single-points-of-failure in the supply chain and process flow. Data Operations and Information Technology are both a single-point-of failure that are absolutely essential to all revenue-generating operations. The print shop is also a single-point-of-failure at least for certain deliverables. However, print shop operations are not critical to revenue-generating operations and this work could be outsourced if necessary. Although not normally classified as a single-point-of-failure, certain environmental controls and security controls are also single-points-of-failure. Is this really the worst case? 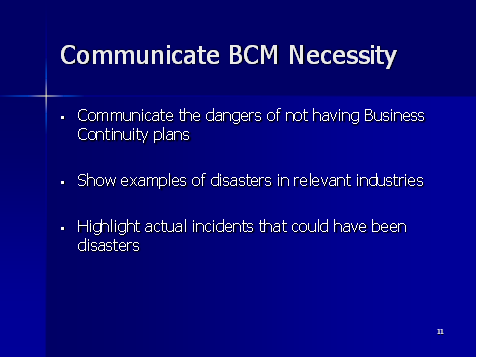 Will BCM that responds well to the ‘smoking hole’ scenario also respond well to all types of crisis events? As bad as this crisis event sounds, it is not the worst case scenario. The “smoking hole” scenario assumes that there are no injuries or fatalities; moreover, the workforce is unaffected and the community-wide infrastructure is not damaged. Although not the worst case scenario, the “smoking hole” scenario is obviously a very major crisis event. If the BCM responds well to the “smoking hole” scenario it will likely respond to most crisis events. Crisis events that could create an even worse situation would be any major community-wide natural crisis (earthquake, hurricane, etc.) or a pandemic outbreak where (unlike the 2009 “Swine Flu” Pandemic) there is an extremely high mortality rate and no effective vaccine available. 1. What are some approaches to assess event probabilities? Estimating the probability of events involves reviewing historical data and discussing the events with relevant groups such as the fire department, weather bureau, utility companies, computer virus incident monitoring agencies, police departments, building engineers, reliability engineers and government agencies. Collecting data from a variety of sources, including: interviews, questionnaires, workshops, documents, observation, data repositories and internal audit. 2. Identify the logistical problems associated with using a distant IT alternate site location during a major community-wide crisis event. Although the IT alternate site is removed from the damaged area, employees may have families that are stranded in a damaged and possibly dangerous area. Employees may also want to return home to repair damaged personal properties. 3. An intercom message is received stating that a hostile intruder situation exists in the building and that a shelter-in-place should be performed. Subsequently, a fire alarm is heard indicating the need to perform a building evacuation. Faced with this conflicting information, what would you do and why? There is imminent danger in the immediate area. 1. ‘Risk Transfer’ is defined as the establishment of procedures or physical controls that will reduce the probability of the risk occurring and/or reduce the impact of the risk. 1. Regarding evacuation and shelter-in-place procedures, which one of the following statements is true? A. Employees should automatically conduct a building evacuation during a hostile intruder threat. B. The procedures for evacuating a hospital are similar to the procedures for evacuating a high-rise building. C. Most organizations can conduct a silent evacuation correctly without any practice. D. There are important differences in the procedures for conducting a shelter-in-place that depend on the type of crisis event. 1. Identify indirect financial losses that can result from loss of operations. Decrease in customer and client satisfaction. Missed filing and reporting deadlines. An increase in risk rating by financial institutions. Buy Business Continuity and Risk Management as an eBook via Google Books! The viability of an organization can be seriously challenged by a disaster. Numerous recent events have focused attention on the need to be prepared for such events. The objective of this text is to provide a comprehensive study of the critical field of business continuity and risk management with particular emphasis on decision making using a holistic approach. The coverage of the book is derived from the growing body of knowledge of practical methods, experiences and research to lead an organization in the process of systematic decisions to protect people, the environment, assets and operations from disastrous events. Because business continuity and risk management often deals with events that are improbable, analyzing these risks is challenging. Risks come in many varieties, and there is a growing concern and associated effort for organizations to respond to the challenge. Organizational resiliency can be accomplished through an effective program in business continuity and risk management based on an understanding of risk methodologies and technologies. 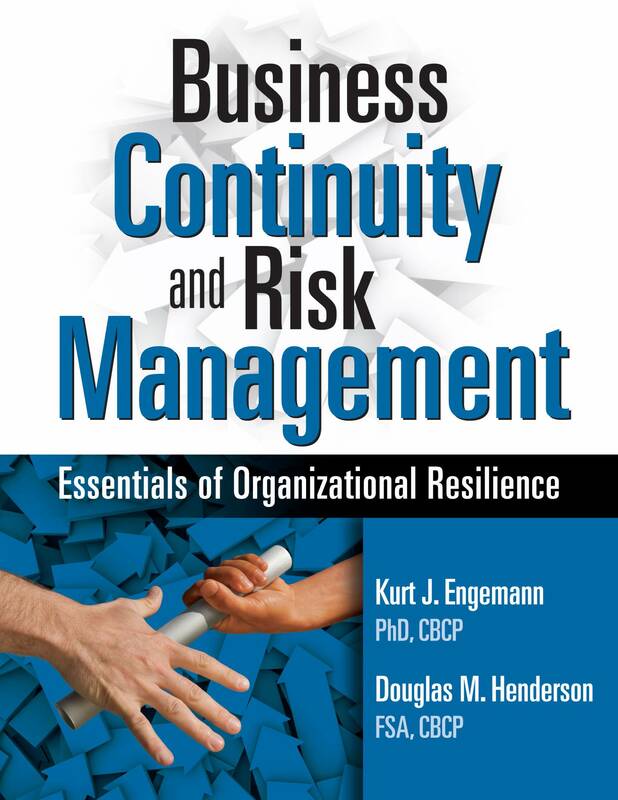 This book can serve as a primary text in an undergraduate or graduate level course that focuses on business continuity and risk management or as a supplemental text in a closely related field. Business students majoring in any concentration, including operations, information systems, management science, finance, accounting, marketing, human resources, management and international business will find the material both interesting and useful. In addition, emergency management students and management engineering students will also find this book very valuable. A wide range of educational and training needs are addressed by the book. In addition to being a text for college courses, this book is also intended for use in professional training programs and as a self-study manual.